When David Hall in 2002 first started Vintage Lorry Funerals he contacted a number of Funeral Directors close to his Bradford-on-Avon base to ask if they would be interested in taking a Marketing Pack, which includes a framed picture of the 1950 Leyland Beaver. The gentleman who answered the telephone at a Funeral Director in Bath declined to take a Marketing Pack and told David, ‘There will never be a need for your type of vehicle in our part of the city!’ Whereas this would have put off a younger person, David was in his 50’s and has a high level of resilience and conversations like this made him more determined to succeed. One of the Funeral Directors in Bath that has been most supportive is Carol Spalding who acquired Clarkson’s in 2004. She has transformed the business, building up an excellent reputation and has opened further Funeral Homes in Frome and Saltford. David Hall was contacted by Dr. Alex Starkie in 2014 and was given his first funeral for Clarkson’s in Frome. It was also the first time that David Hall has ever worked for a former Forensic Scientist and Alex’s attention to detail and quality of planning were transferable skills from her previous employment. The funeral was for a former Coach Driver and as this was the first Bus Driver that David Hall had carried on his lorry, David agreed with a member of the Family that he would create the rear of a School Bus in front of the coffin. As this was the first time that Vintage Lorry Funerals was asked to go to Mendip Crematorium in Shepton Mallet, David asked that the height under the Porte Cochere be measured. Given that the clearance to the top of the cab was less than 2 inches David decided to visit the site to check whether the slope of the ground would dictate a specific angle of approach. The staff members John and Bethany, at this Dignity facility, were very friendly and were very interested that the Vintage Lorry would be visiting their site. David also looked at a number of options for strategic parking around Clarkson’s Frome location. This would allow the lorry to be parked in a 0730-0800 hours window, whilst the Funeral Director was opening up the facility and moving out two vehicles, clearing space to accommodate the 26 feet long Leyland Beaver. Within 100 yards of Clarkson’s there is a property that was previously a Fuel Station but was now manned by Car Washers, who were from Eastern Europe and spoke little English. David gave one of the men a Vintage Lorry Funerals business card, which features a picture of the lorry in action, pointed to Clarkson’s and wrote the date and time that he would require temporary parking on the back of the card. Two days before the funeral David became aware that his own Father was critically ill and arranged that once he had returned from Shepton Mallet he would immediately drive in his car to Coldsprings Care Home in Penrith. David left for Frome at 0645 hours and for the first time ever he took no packed lunch with him. The Vintage Lorry arrived at the Washing Facility at 0715 hours and David found that the security chain had been removed, making access possible. As David was reversing into the yard one of the Eastern Europeans, who was starting work, put up his thumb to signify that everything was alright and David reciprocated the gesture. The thumbs up or down gesture is apparently recognised outside Britain, however, it probably originates from Sunday Night at The London Palladium , when Norman Vaughan was the Compare, taking over from Bruce Forsyth in January 1962. Norman used the thumbs up and down gestures with his catch phrase, ‘Swinging or Dodgy’. Reversing into Clarkson’s facility wasn’t easy given the slope of the road and angle of the wall and David was disappointed that he didn’t get in on his first approach. Alex Starkie was very interested in how the coffin would be loaded onto the vehicle and turned on the deck, and decided to use a Mortuary Trolley, given that only 3 staff were present. This was the first time that when using such facility that the coffin was loaded and turned in the same motion. Alex explained that no limousines had been booked with the Family meeting at Mendip Crematorium. So for the first time the 1950 Leyland Beaver went on its own, from the Funeral Directors to the Crematorium. With no one in the cab with him, David cruised down the A361 and no one tried to come past him, with drivers displaying a high level of respect. The Mendip Crematorium is situated in open country with the access being on a narrow road out of Shepton Mallet. Just before the entrance, heavy rain the previous day had caused water to stream off the fields and caused a flood on the road and this was the first time that the Leyland Beaver had to go through a stretch of water before a Crematorium. As David spun the Leyland Beaver under the porte cochere some of the mourners looked aghast worrying that the cab may catch the main support timber of the structure. David smiled and used the thumbs up signal to relate that he would have no problems. After the funeral David took a picture of Alex Starkie ,on the right, and Bethany Welch, Memorial Consultant at the Mendip Crematorium being on the left. David felt that the picture he took was very interesting as it contained Dr. Alex Starkie, a former Forensic Scientist like those featured in Silent Witness, next to a lady with more than a passing resemblance to Dr Nikki Alexander, of Silent Witness. From the cab of the Leyland Beaver David sees a lot of interesting wildlife on his travels including badgers, foxes, deer and all types of birds particularly Red Kites in certain parts of the country. 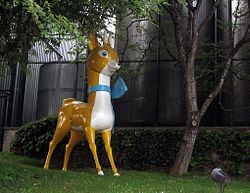 Coming north on the A37 out of Shepton Mallet David saw an 8 foot deer fawn for the first time, not in a field but on a concrete plinth outside the Babycham Factory. When David arrived home he jumped out of the lorry and into his car reaching Coldsprings Care Home at 2200 hours. David’s sister made him a cup of tea to quench his thirst (first) after a long day. David and his wife spent some quality time with his Father before he passed away on a Saturday morning at 0300 hours. In the Historic Vehicle world there is competitive tension between people who own a bus and those that own a lorry and this manifests itself at gatherings with lorries parked at one end of the tarmac and the buses at the other end. So David was very pleased that he had taken his first Bus Driver on his final journey and he approached Coach & Bus Week to see if an obituary article could be submitted. Gareth Evans, Editor, was very interested and printed 500 words with one picture and he told David that he was keen to push the boundaries in everything he did. He also confirmed that this was the first time a lorry had appeared in Coach & Bus Week.